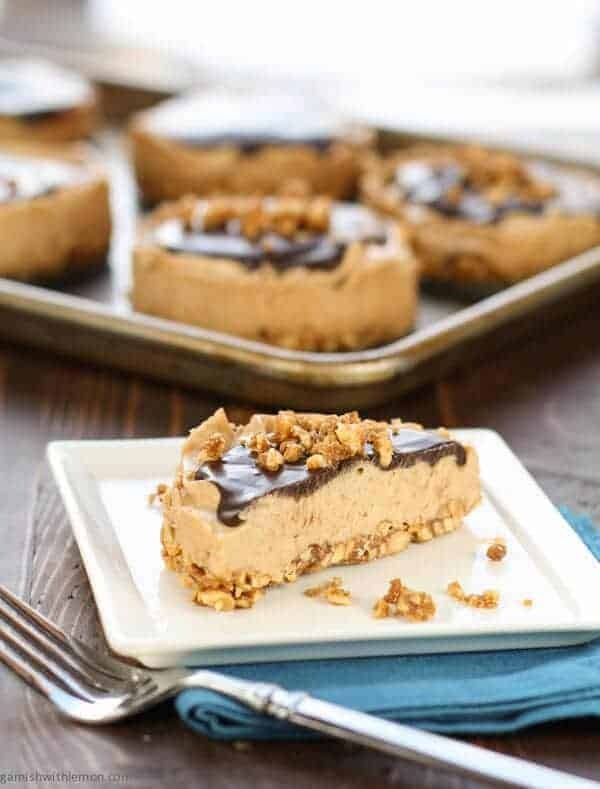 These Peanut Butter Snickerdoodle Tarts with Cinnamon Peanut Crust combine all of my favorite cookie flavors in one amazing dessert! Do you and your family have favorite holiday baked goods every year? You know, the ones you HAVE to make or face a family uprising? I know we have some standbys (Easy Rolo Pretzel Turtles, anyone? ), but I always try to incorporate something different every year. In fact, that’s often how we find some of our new favorites. 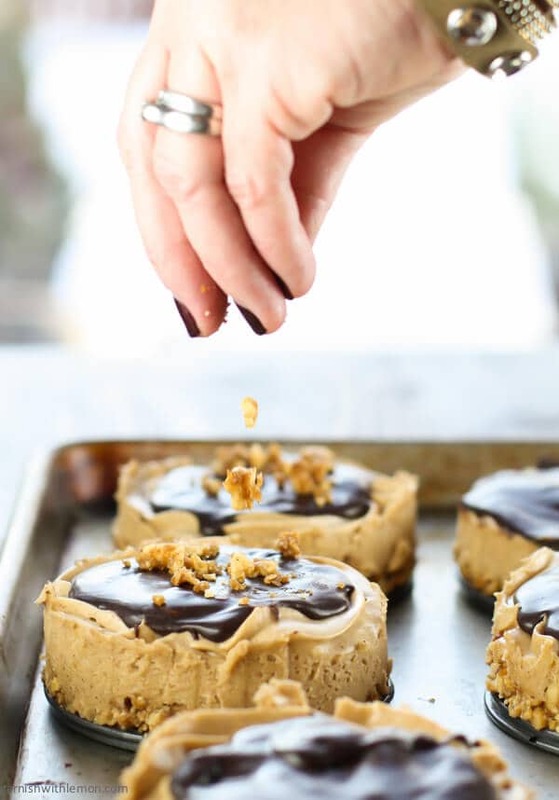 This year we tried these Peanut Butter Snickerdoodle Tarts with Cinnamon Peanut Crust, and they have definitely been fast-tracked to cult status. If you take a look at the ingredients, you’ll agree it’s hard to go wrong. 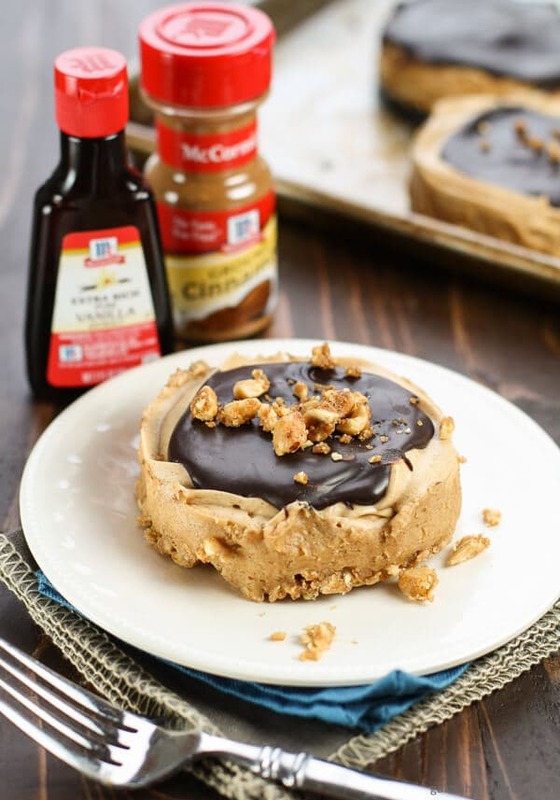 Imagine a salty-sweet cinnamon peanut crust with a fluffly peanut butter filling and topped with a chocolate milk ganache. Insane goodness here, folks. I wish I could say that I was the brilliant author of this recipe, but that honor goes to our friends at McCormick® as part of their 2015 Flavor Forecast. Ever year McCormick® taps its extensive network of global chefs and flavor experts and identifies trends that will change the way people eat at restaurants and cook in their kitchens in the coming year. There are 8 trends in the Flavor Forecast for 2015, including the inspiration for these tarts, the “Cookies Reimagined” trend: where classic spiced cookie flavors take new form in decadent, imaginative desserts that redefine “milk and cookies”. While “trendy” is never a word I would use to describe myself, I’ll gladly accept the title if it means more insanely delicious food like this. Interested in learning more? Check out all of the 2015 trends at the McCormick® Flavor Forecast website along with some gorgeous recipes that give you a taste of each of the trends. Don’t forget to post your creations on social media using the #FlavorForecast hashtag so I can drool over them see them, too! Preheat oven to 350 degrees. Mix peanuts, sugar, butter and 1/2 teaspoon of the cinnamon in medium bowl. Remove 1/4 cup and spread on small baking sheet. Divide remaining peanut mixture among 4 (4-inch) tart pans with removable bottoms. Press firmly onto bottom and up sides of each tart pan. Bake tart crusts and peanut mixture together for 8 minutes. Cool on wire racks. Meanwhile, microwave chocolate milk in medium microwavable bowl on HIGH 45 seconds. Add chocolate; stir until chocolate is completely melted and mixture is smooth. Set aside. Beat peanut butter, sweetened condensed milk, vanilla and remaining 1/2 teaspoon cinnamon in large bowl with electric mixture on medium speed until smooth. Add heavy cream; beat until soft peaks form. Spread in prepared tarts crusts. Spread chocolate mixture over top. This post is sponsored by McCormick®. All opinions are my own. Thanks for supporting the brands that make Garnish with Lemon possible. You combined two of my fave things: peanut butter and snickerdoodles!!! love these Peanut Butter Snickerdoodle Tarts!! It’s a pretty awesome flavor combo, Alice. I hope you try it! We do have certain holiday treats that MUST be made every year. I have a feeling that if I made these tarts, they’d immediately be added to that list. Holy heck, these look good! This dessert looks awesome! I love the hint of cinnamon! It’s a fun twist, don’t you think? Just when I think I know my holiday baking list, I stumble on this recipe…good grief this sounds amazing!!! I can vouch for the goodness! This tart is AHmazing!! I am loving the flavors and loving everything about the recipe. You nailed it girls! I love spice in my cookies, especially cinnamon. It just really brings out the chocolate ganache and peanut butter. Clove would be a great addition too. Can’t wait to try these tarts!